Authors and copyeditors frequently wonder how best to cite dictionaries, encyclopedias, lexica, and grammars. Although SBLHS §§6.3.6 (An Article in an Encyclopedia or a Dictionary) and 6.3.7 (An Article in a Lexicon or a Theological Dictionary) offer some help, a number of specifics remain unclear. To bring clarity to the issue, the SBLHS blog will offer a series of posts addressing the different types of reference works that authors frequently cite. We encourage readers to email us with questions about specific reference works. Our goal for the series is to address as many questions as possible that authors and copyeditors are likely to encounter. This first post sets the groundwork for the ensuing discussion by identifying several key distinctions that will be important to keep in mind. 1. Entries versus articles. The nature of the piece often determines the rules of citation: short entries such as those found in BDB or DCH are treated differently than the longer articles in TDOT or TLOT. This series of posts will thus use the terms entry and article precisely to reflect this difference. 2. Signed versus unsigned pieces. Whether a piece is signed or unsigned will likewise affect the way it should be cited. Although reference entries are more often unsigned than articles and articles more often signed than entries, one should not assume a simple correspondence between the two. In fact, some reference works (e.g., HBD) contain both unsigned and signed articles that are best cited in different ways. 3. Authored versus edited work. Some reference works are authored by a small number of scholars (e.g., GKC, BDAG); others contain the contributions of a large number of scholars whose work has been collected by one or more editors (e.g., NIDB, ABD). The type of work will generally influence the way a piece within that work should be cited. 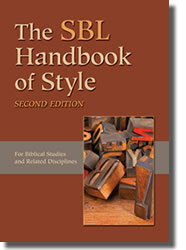 These three sets of distinctions will guide and organize our discussion in the series, as we discuss the citation of unsigned dictionary or lexicon entries in reference works such as BDAG/BAGD/BAG (this lexicon merits its own post), BDB, LSJ, and HALOT; unsigned articles in dictionaries such as HBD and ABD; signed articles in encyclopedias such as EBR and NIDB; and any other reference works about which readers ask. One final note: this series will both clarify and, as necessary, revise the information found in SLBHS §§6.3.6–7 and CMS 14.247–48. As always, the guidelines offered will not be a matter of right versus wrong, correct versus incorrect; rather, the guidelines will reflect SBL Press preferences for our own publications. That being said, we hope that other publishers will adopt these guidelines, in order to promote greater consistency across the discipline.